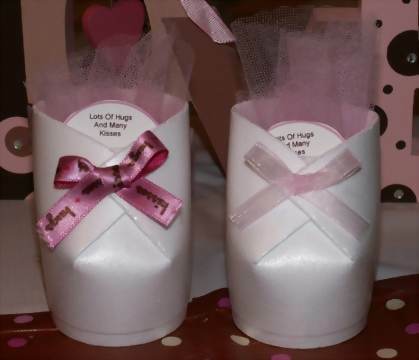 Create baby bootie cups to dress up your baby shower. Our instructions will teach you how to quickly make these fun baby shower crafts. These cute cups can be filled with candies, nuts, or other favor items and given to your guests. You can also use them as decorations around the room or on the tables. Take an 8oz. 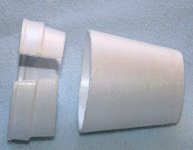 Styrofoam cup and cut about an inch off of the top. (I like to cut 2 slits before I start to help ease the scissors into cutting). Cut a slit starting at the top of the cup and cut downward until you are about an inch from the bottom of the cup. Make a matching slit with a space of an inch to an inch and a half in-between. This will become the tongue of your shoe. Push the tongue back and bring the sides in to create flaps over the tongue. 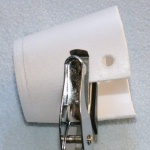 Take your hole punch and punch matching holes on each flap. Lace the ribbon through the baby booties like you would a shoe. Place a tulle circle inside your bootie cup and fill with treats. Add lace inside or around the edge to the cup. Wrap with cellophane and curling ribbon for that extra touch. Paint with acrylic paint or sparkle glaze. You can use decorative scissors to cut the top of the bootie. It adds a nice touch to it. Cut one hole on each side of the shoe instead of two. Use paper cups instead of Styrofoam. They have a lot of great designs on the cups that can really make cute baby booties. Add some speed to your crafting! Instead of punching holes, place a dot of hot glue to the flaps to hold it together. Then hot glue a bow to it. It is both quick and beautiful! Would you like a printable copy of these bootie cup instructions?